The Jakarta Komodos Junior Rugby (JKJR) Club punched well above its weight against more experienced teams from larger regional clubs at the Centaurs International Mini & Youth Rugby Tournament in Singapore over the weekend ending Dec. 6. Jess Djamhoer, who heads the JKJR rugby development programme, said she hadn’t stopped smiling since returning home from Singapore given not only moments of individual brilliance by Komodos’ players, but by the determination and motivation of some of the newer places, and the overall team performances. The Under 7s team playing their first competitive 8-a-side touch matches of the season finished 5th in a field of 16 teams, taking home the Bowl Cup with a resounding two try to zero victory against home side the Centaurs Cavaliers. Cameron said the Komodos wished to thank Under 7s co-coach Graham Orr, who had been a great asset to the club but was sadly leaving Indonesia along with his wonderful family, including Under 7s superstar Robbie. “I nominate him a life-long Komodo player, and as such he is prohibited from every playing against us in the future,” he said. 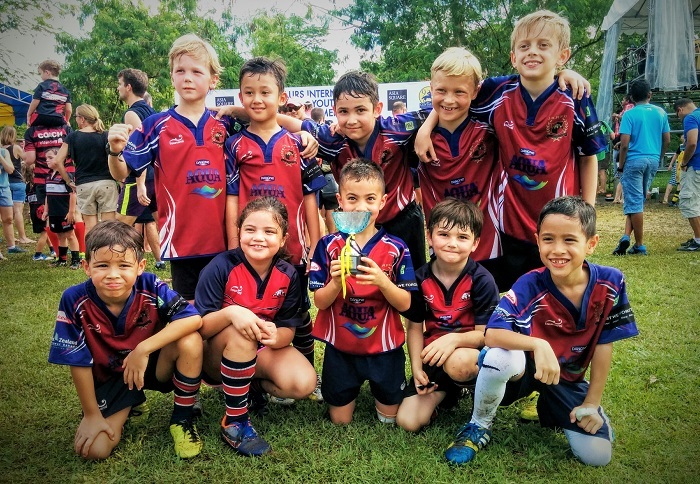 Stepping up a level into the world of tackle rugby, the Komodos Under 9s closed out 2015 with a team result that far exceeded previous results. Though the team drew the first match against eventual Bowl Cup winners the Centaurs Archers and lost the next game against finalists KL Tigers, one of Asia’s best youth clubs, the Komodos lifted their performances to win the next five games in a row, including going unbeaten on the second day of the tournament. Scalps included the Tanglin Rugby Club Chiefs (twice, with each game ending 3-0), the KL Saracens and the Cobrats. Under 9s coach Johannes Spies said the loss was hard to take. “In perspective though, our loss of 5:0 against the KL Tigers is a massive improvement to the 11:0 loss against them in May, where we played like a lost flock of lambs scared by a wild cat,” Johan said. “This time, the Tigers had to work hard to break the power of our pack, something the other six teams could not do. The Komodos were privileged to have been able to sponsor five boy from the village of Krangan near our training ground in Jagorawi on the Singapore tour, being in the position to fund passports, flights and upmarket accommodation thanks to the generosity of club sponsors, individual club members and supporters, and anyone who has enjoyed a hot-dog at recent club events. The Komodos would also like to thank parents Rini and David Hewitt whose production house is preparing a viral-style video documenting the boys’ journey from Krangan to Singapore. More on this later. The Under 12s started had a tough first day at the office but finished strongly with a win, followed by two victories out of two on the second day of the tournament, including a 3-1 win against the Nedlands Rugby Club of Australia and a 3-0 result against Macau RFC. The boys showed fantastic courage and resilience to bounce back from the early results and should take heart in the fact that they will only continue to improve. All the club have a vested interested in following the Under 12s’ performance and their rise onto the higher age groups and hopefully Seniors’ side. All the JKJR teams will be practising on the Saturdays of December 12 and 19 before we take a break for two weekends. See you there.